Glenlochy is yet another of the distilleries that were closed in the early 1980s (in 1983 to be exact). Not very well-known outside of ultra-geeky circles until just a few years ago, the reputation (and prices) of its remaining malt has risen sharply recently and the supply has dwindled (even Serge has only reviewed 16 bottles from Glenlochy). Glenlochy is all but impossible to find in the US and is never cheap–only two bottles show up on Wine Searcher and both are north of $400. 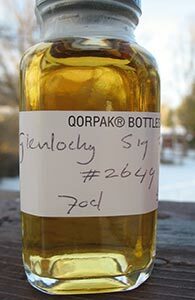 This sample is from a Signatory release in the EU (as Glenlochy predominantly made whisky for blends when active, the little that’s available now is from the indies). Nose: Quite fruity off the bat with some dark raisin notes but also some ripe bananas and peaches and a touch of papaya (or you might just say nail polish remover); a little bit of honey too. With more time there’s some roasted malt and lightly tannic oak. With a lot more time there’re very nice notes of dried tangerine peel and apricot and a touch of brine. Water weakens the late developing goodness. Palate: A little spirity and even a bit grainy on the palate which also feels thinner than you might expect at 52.8% (which is not to say that there is no alcohol burn, merely that the texture is thin). Not much of the fruit at first sip. And not much on the second sip either: it’s mostly the honey and roasted malt here. With more time the citrus starts showing up earlier and begins to shade towards apricot. Hmmm unlike on the nose, water seems to awaken a little more complexity on the palate: the roasted malt rubs shoulders with some mocha and the apricot/citrus notes get a little stronger. Finish: Medium. There’s some citrus here and an increasing (but not unpleasant) bitterness from the wood. Water lengthens the finish a bit, pushes back the wood and amplifies the citrus. Comments: I really liked the nose on this but the palate was a bit of a letdown, though it did improve with water. Perhaps it would have been a little more vibrant if bottled a little younger. Still, I’m very glad I got to try a Glenlochy–not sure how many more opportunities I’ll have.